Heat oven to 400°F. In small bowl, mix Filling ingredients; set aside. Line large cookie sheet with cooking parchment paper. Unroll dough onto lightly floured surface; roll into 14x12-inch rectangle. Using pizza cutter, cut dough lengthwise into 4 strips. Spoon about 1/4 cup of the filling onto long edge of each dough strip. Stretch dough over filling; brush edges with water, and pinch to seal. Pick up ends of filled dough, and stretch to make 24-inch rope. To make pretzel shape, form each rope into U shape. Twist ends twice. Press down where dough overlaps in an "X" to hold shape. Pick up ends and fold over so they rest over bottom of U shape. In medium microwavable bowl, microwave 2 cups water uncovered on High about 2 minutes or until hot. Add baking soda; stir until dissolved. Dip each pretzel, 1 at a time, into water mixture. Immediately remove from water with large pancake turner; let stand about 5 minutes. In small bowl, beat egg and 1 tablespoon water with whisk; brush pretzels with egg mixture. 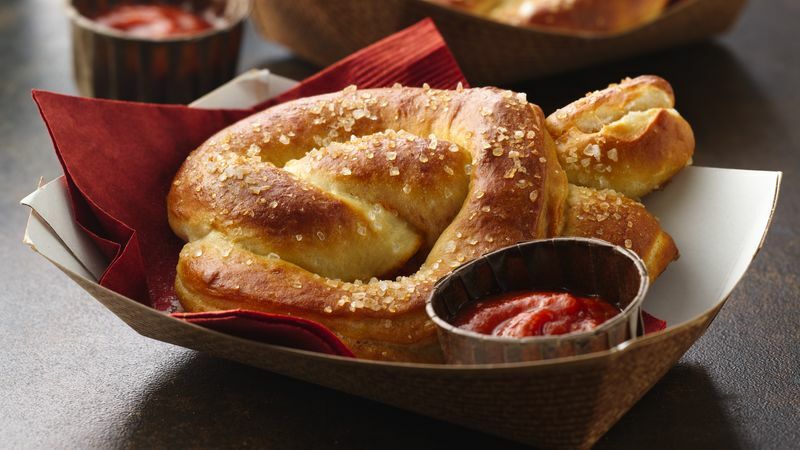 Place pretzels on cookie sheet; sprinkle with salt. Bake 11 to 15 minutes or until tops of pretzels are dark golden brown. Serve with pizza sauce.